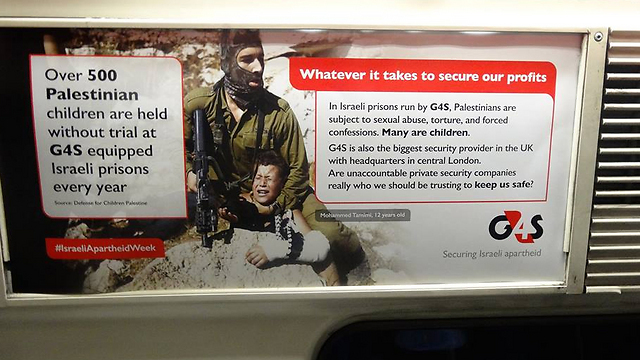 On Monday the claims for credit were swirling as the Israeli government condemned a series of four billboards, which appeared on about 500 BDS posters on the London Underground trains. 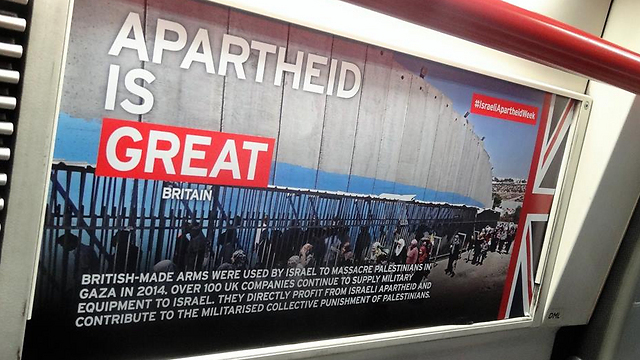 They looked like genuine ads and were allegedly pasted on tube trains by London Palestine Action as part of this year’s Israeli Apartheid Week. Prime Minister Benjamin Netanyahu asked Israel’s foreign ministry director, Dore Gold, “… to demand from the British government that the posters be removed,” he told parliamentary colleagues, according to reports in the Israeli media. When you examine the photos (above and left) of the posters, they appear to be very carefully mounted inside a metal frame, suggesting that the perpetrators spent considerable time posting them. The London Jewish Forum called the posters an act of vandalism and “awful smears that do nothing to contribute to peace and dialogue, placing significant strains on inter-community relations across London”. London police also called it vandalism and posting on the fly. How can such things happen in the London Underground, you might ask? The answer is that such vandalism – if it was that – cannot go unnoticed. We have access to 30,000 cameras, via a London-based CCTV Hub, opened in 2012. In the Hub, we can download video to create evidence packages, and identify suspects. We can also track individuals in real time where we have intelligence to suspect them. Our team of crime reduction officers advise railway businesses on their CCTV needs and we are part of a national scheme, sponsored by the Home Office and the Association of Chief Police Officers (ACPO), that in 2007 made 44 recommendations in to how CCTV is best used. …London Underground operates over 8,500 cameras on its stations and trains. These cameras are managed and recorded locally, but can be viewed instantly by police control room staff. At London Euston, we have set up a proactive CCTV unit, who develop intelligence about particular locations and suspects. My opinion is that the posters were authorized by Transport for London. If they want to deny this was a deliberate antisemitic act, they should review the 8,500 CCTV cameras in the London Underground and trains and then show the world footage of the perpetrators. Instead of just excusing the travesty as “vandalism”, Israeli officials should demand investigation. And if the British officials are in cahoots with BDS maniacs, they should be condemned by the Jewish and international communities. Experts say that surveillance cameras can be used to your advantage but it can also be used against you, especially when it comes to your privacy. It is wise to learn few tricks to know if someone is unwarranted monitoring your move. If you want to protect your property, then you may want to invest on good quality CCTV cameras. There are many different good brands of surveillance systems. Investing on these brands can help you deter criminals away from your property.